Bring the outdoors in by assembling your own evergreen centerpiece to run down the center of your dining room table this Christmas. By layering a variety of evergreen branches, berries and pine cones you DIY a large centerpiece without spending much money. 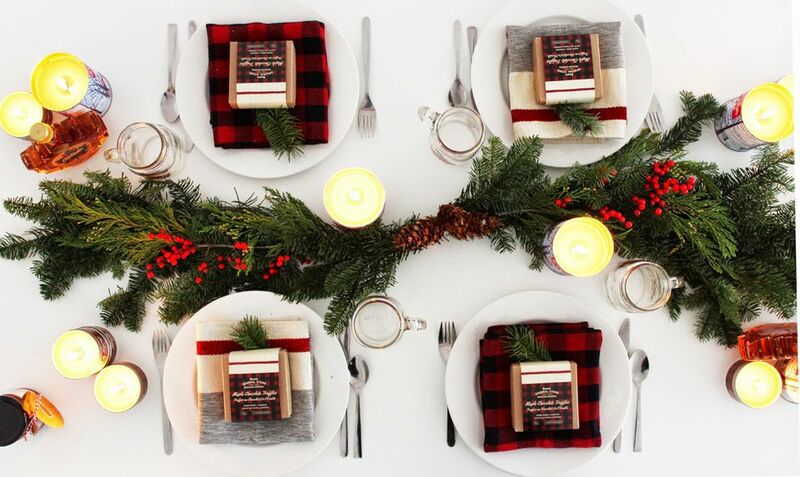 No elegant holiday tablescape is complete without place cards! And these do double duty. Fill clear ornaments to act as place cards at your party, and your guests can take them home at the end of the night as party favors to hang on their trees. Christmas crackers are a popular addition to the Christmas dinner table, but often they are filled with horrible prizes such as sheets of jokes and a paper hat. Solve this problem by making your own classy looking marble Christmas cracker that you fill with an amazing small prize. No matter if you are serving cocktails or juice any beverage will look extra festive with a handmade Christmas tree drink stir stick left in the glass. These amazing stir sticks can be made in just a few minutes by gluing miniature bottle brush trees to wooden skewers. Set the table this Christmas with a chic handmade marble and copper vase that is made using contact paper and gold leaf to give a luxurious finish to your artificial magnolia blossoms and greenery. By using artificial flowers you will be able to keep this arrangement on your table all winter long or prepare a second one in advance to give to a friend as a gift. Add the merry sound of ringing bells to your holiday table by making small bell charms to tie around the base of wine glasses. While toasting the holiday season, everyone at the table is sure to smile as the family causes their bells to ring in unison. The combination of fresh citrus, woods pine, and spicy cloves from a handmade topiary that makes a pretty centerpiece for your table will fill your home with their delicious scents well after the meal has finished. Enhance the base of your stemmed glasses on your holiday table by making adorable mini Christmas wreaths out of fresh pieces of greenery to sit at the base of the glasses. When combined with an evergreen centerpiece, the mini wreath on the glasses will give a cohesive Christmas table that will look straight out of a magazine. Alternate mason jars filled with fresh cranberries and evergreen branches and jars with a lit candle for the perfect last minute centerpiece for your Christmas table that will fill your dining room with lovely soft lighting. Often after the table has been set the empty plates on the table might look too bland, so one was to enhance them is to leave a napkin in the center topped with a beautiful placeholder that will enhance your dinner plates until the meal is ready to begin. You can make your own winter placeholders with a surprising item, chili peppers which are painted gold and tied with a small piece of evergreen branch. Traditionally stringing together cranberries together, sometimes with popcorn, was a popular was to create a decorative garland for the Christmas tree. In a similar fashion, using a bag of fresh cranberries you can string them together to make mini cranberry wreaths that make outstanding place card holders for your Christmas brunch. Are you looking for a way to make your dining room seem more festive this Christmas? One dramatic way to enhance your table is to DIY your own winter-themed chandelier to hang above the table. To add some extra drama to the chandelier hang small pieces of yarn from the wreath to hang down from the wreath. Add some extra sparkle to your holiday table this year by updating your collection of decorative bottle brush trees by adding gold to them for a fresh new look. Your new gold dipped bottle brush trees can them be arranged down the middle of your table as an inexpensive centerpiece that can last all winter. For a spectacular cheese course at your holiday meal, you will need a tray to assemble your selected cheeses on. You can easily make your own beautiful serving tray that combines a piece of wood and marble for a simple elegant tray that is perfect for cutting cheese on. This is a great DIY for the kids to help out with, prior to Christmas head outdoors with the kids to collect fallen pine cones and paint them gold to make some quick and easy place card holders for your Christmas table. Set the table with a grouping of low floating candle holders for some soft lighting at your Christmas meal by making some DIY candle holders out of old wine bottles. This DIY project is a great way to reuse empty wine bottles you have around the house to become a decorative item for your home. When making the floating candle holders you can use either all green wine bottles, only clear bottles or half of clear and half of green depending on what would match best with the rest of your decor. For a cheerful and fun table decor for your holiday party string together paper honeycombs with round Christmas ornaments and hang them from the ceiling above your table for an amazing centerpiece. This clever decorating idea is super affordable to do, as you can repurpose your extra Christmas ornaments and paper honeycombs that you use to decorate for birthday parties into a large temporary chandelier. On the cold nights of winter add a lovely soft warm glow to your table by making some gold dipped candle holders for your dining room table. After you have set the table with a tablecloth, dishes, and cutlery, it is time to consider the small additional details to make your table look extra special for the holiday meal you will hosting in your home. One easy way to do this is to place mini boxwood wreath in the center of each plate to add some color and texture to your table. These wreaths can then easily be turned into place cards by attaching a small piece of paper with each person's name onto each wreath. Use up your extra Christmas cardstock sheets from all your winter craft projects to make a set of Christmas tree napkin rings perfect for dressing up your table this winter. Turn your table into a winter wonderland by adding rustic elements to your table such as handmade woodland animal place cards. You can make your own moose place card to stand in front of each place setting by slipping a small piece of paper with a name written on it in the antlers of a plastic toy moose for a simple table DIY.